After years of lukewarm involvement in Formula 1 the Ford Motor Company became a much more aggressive force after Jac Nasser took control of the company in 1999. The company had acquired Cosworth Racing in July 1998 and risked an exciting new engine in 1999. 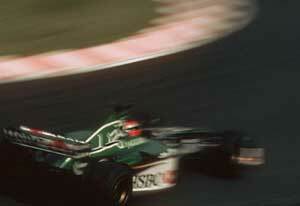 The gamble paid off when Johnny Herbert won the European GP at the Nurburgring. In June 1999, however, Ford bought Stewart Grand Prix and in September announced that it was hiring Ferrari's Eddie Irvine to partner Herbert in a Jaguar factory team in 2000. The first season was not a success with the Jaguar R1 being a very difficult chassis and in the midseason team chairman Neil Ressler began restructuring, taking on Bobby Rahal to run the team. This led to a cleanout of the technical team at the end of the year with Steve Nichols taking over from Gary Anderson as technical director. Soon afterwards FordÕs Jac Nasser agreed to give control of the program to Wolfgang Reitzle, the head of FordÕs Premier Automotive Group. Reitzle wanted his own men and hired Niki Lauda to be head of the Premier Performance Division, of which Jaguar Racing a part. This led to friction between Rahal and Lauda. RahalÕs primary aim was to sign a deal with McLarenÕs Adrian Newey but this was thwarted and Rahal and Lauda then clashed over driver Eddie Irvine. The result was that Rahal departed in the course of 2001. Lauda stayed in charge until the end of 2002 but by then Reitzle had gone and the Jaguar R3 had been a disaster and most of the technical staff had departed. At the end of 2002 Ford named Tony Purnell to replace Lauda and David Pitchforth was named managing-director. The new theory was that the engineers would run the team. The team hired Mark Webber and Antonio Pizzonia for 2003 but politics still intervened and Pizzonia was soon dropped in favour of Justin Wilson. Webber stayed on in 2004 and was joined by Christian Klien, who came with Red Bull money, an indication of Ford's waning interest in the team. In the autumn Ford announced that it was quitting F1 and sold the team to Red Bull.